In a large bowl mix the oats, almonds, pecans, walnuts, pepita seeds, and sunflower seeds. Stir well until the nuts and oats are well combined. In a medium bowl, combine the maple syrup, coconut oil and vanilla. Add the cinnamon, cardamom, ginger and nutmeg. Whisk well and pour the mixture over the oats and nuts, then stir until everything evenly coated. 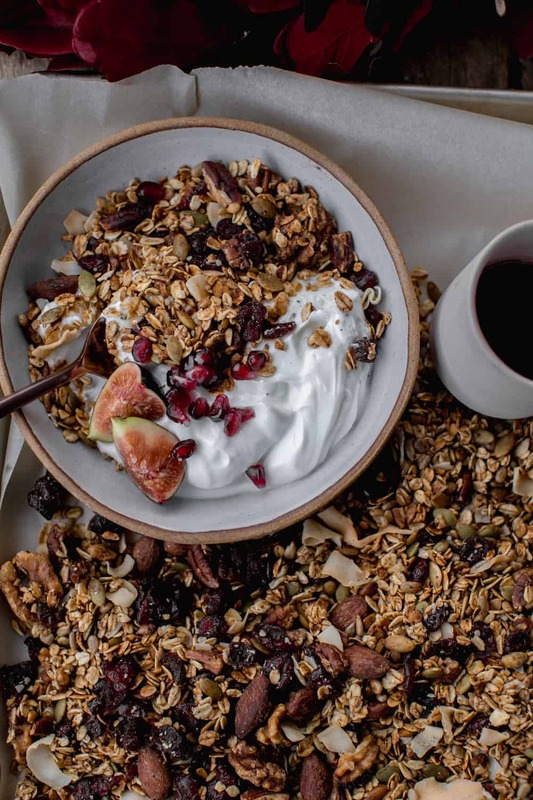 Divide the granola evenly between the two trays and flatten lightly with a spoon. Bake for 35 minutes, stirring every 10 minutes until golden and toasty. Let trays cool on a cooling rack and add the cranberries, coconut flakes, sesame seeds, chia seeds, and hemp hearts evenly on both trays. Enjoy with Greek yogurt and your favourite fruit. The granola keeps well for over a month, just store it in airtight containers.